Cheesy Chicken Casserole with Cauliflower Rice takes on all of the same flavors of a traditional cheesy chicken and broccoli casserole but with only 7 net carbs per serving! It’s an easy dinner recipe that the whole family will love! 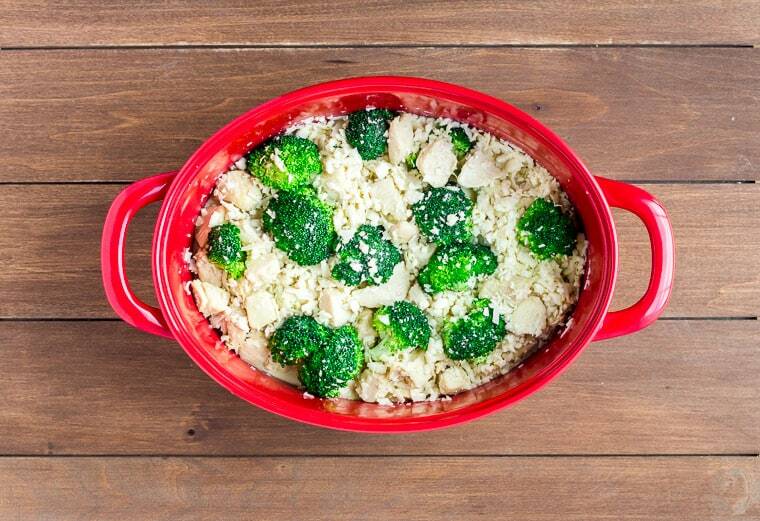 I’ve been a long time fan of cheesy broccoli rice casseroles – with or without meat. I even used to buy the prepackaged boxes of flavored rice and eat that for dinner during the 10 years that I was a vegetarian. I just had to come up with a low carb modification of a classic chicken casserole recipe that’s also family-friendly. This Cheesy Chicken Casserole has only 7 net carbohydrates per serving. It’s also gluten free. Cauliflower rice was the obvious choice to replace traditional rice. Then, I mix in chicken, broccoli, and plenty of cheese! I use chicken bone broth and a little heavy whipping cream to give even more flavor. Honestly, you can barely tell that you’re eating cauliflower! I’ve made this recipe with several different types of cheese to see which works best. Gouda and fontina cheese are my personal favorites and the two I would recommend. Classic chicken casserole flavors and ingredients are used to create an equally delicious dish with a fraction of the carbohydrates. It’s a family-friendly recipe that even kids will love. It’s naturally gluten free as written. While this is a really easy recipe to throw together, there is a little prep work for this Keto Cheesy Chicken Casserole recipe. I always recommend doing all of the prep work before you begin to save time in the long run. If you are not using leftover or pre-cooked bacon, you will need to cook and crumble it ahead of time. I usually cook it while I am doing some of the other prep work. Cut the chicken into bite size cubes, mince the garlic, and shred the cheese. I recommend either Gouda or fontina cheese for this recipe. I’ve never seen pre-shredded Gouda or fontina cheese, but it’s always best to shred cheese yourself from a block anyway. Pre-shredded cheese usually contains a starch to keep it from sticking to itself. It just doesn’t melt as well. If you can, buy the cauliflower already riced from the produce department. If you can’t find it already riced, you can do it with a manually or with a food processor. 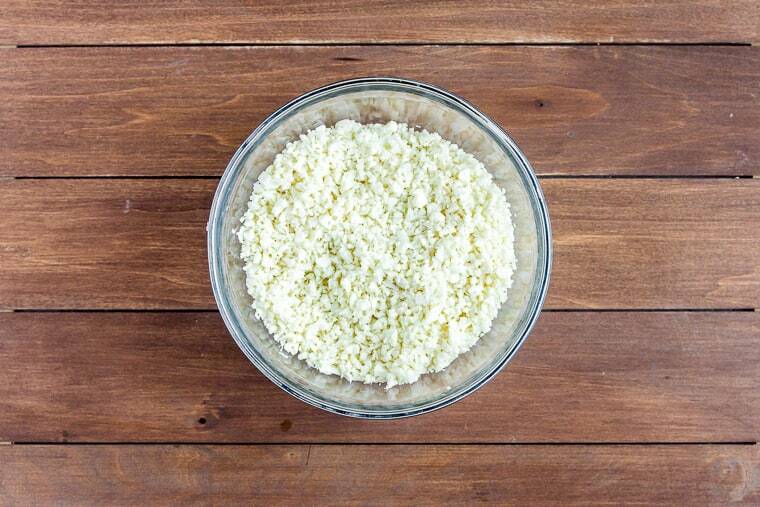 It only takes a few pulses to rice cauliflower in a food processor. Frozen cauliflower rice is not recommended. Add the olive oil to a large skillet over medium heat and add the garlic. Cook for 1 minute. 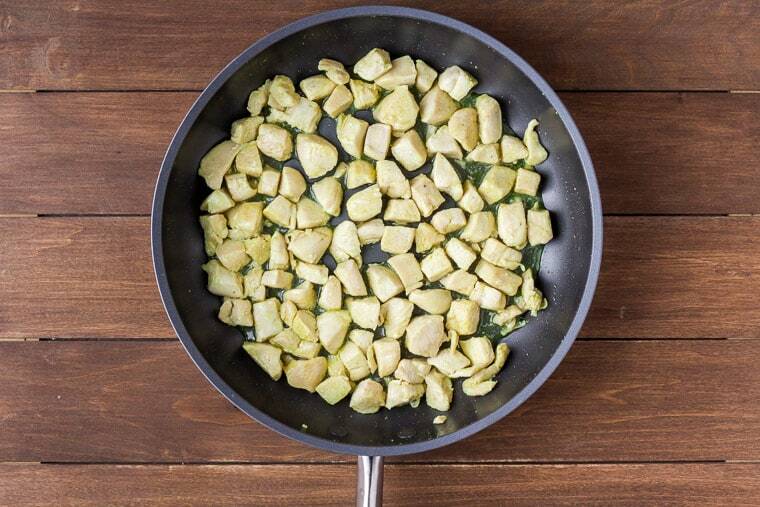 Season the chicken cubes with the adobo seasoning and add to the skillet with the garlic. Cook, turning a few times, until just cooked through, about 6-7 minutes. 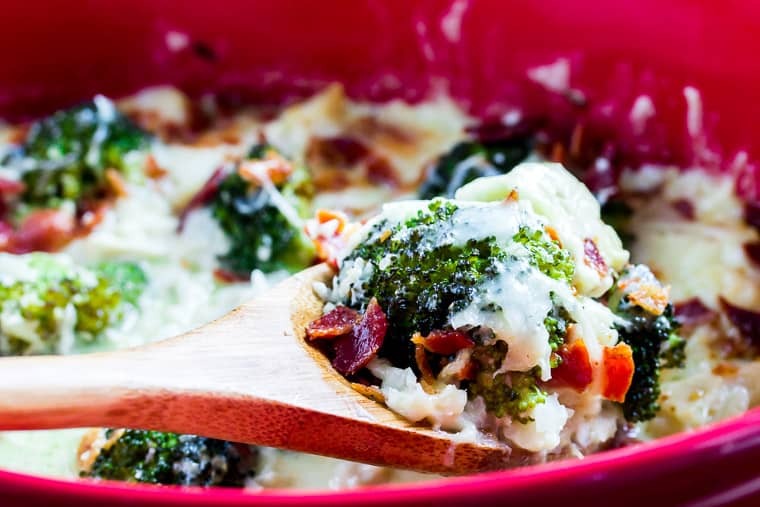 Add the riced cauliflower, broccoli florets, cooked chicken, bone broth, heavy whipping cream, 1/2 of the Gouda or fontina cheese and 1/2 of the bacon to a large casserole dish. Season with the salt and pepper and mix until well combined. Cover the casserole dish with a lid or aluminum foil and bake for 45 minutes. 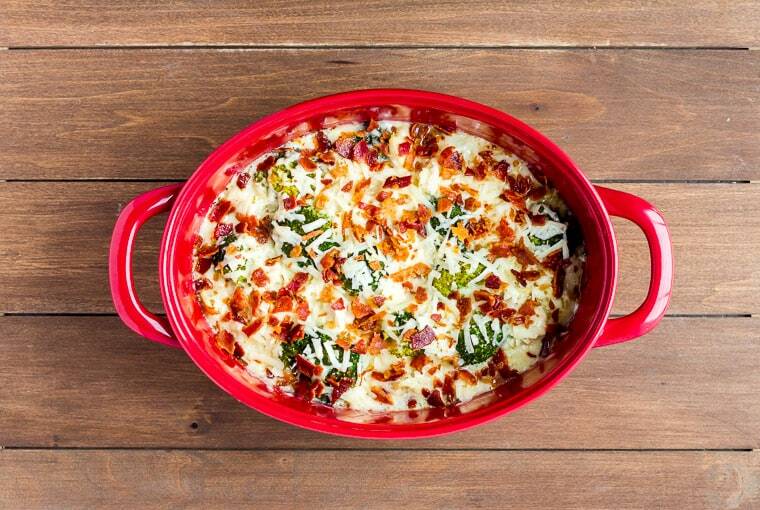 Uncover the casserole and top with the remaining Gouda or fontina cheese and bacon. Bake an additional 5-10 minutes until the cheese on top is melted and bubbly. Serve hot right out of the casserole dish! Shred the Gouda or fontina cheese from a block. Do not use pre-shredded cheese as it contains a starch to prevent it from sticking to itself. This starch increases the carb count and keeps the cheese from melting nicely. Save time by purchasing already riced cauliflower from the produce section. Frozen riced cauliflower is not recommended and may lead to a more “watery” casserole. 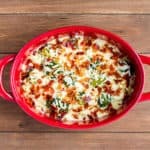 Store leftover Keto Cheesy Chicken Casserole in an air-tight container in the refrigerator. Use within 3-4 days. Can you make chicken casserole ahead of time? Yes. You can either make it ahead of time and keep it in the refrigerator if you plan to cook it within 1-2 days. Or, you can assemble the casserole and freeze it, unbaked, for up to 4 months. You can bake it from frozen or allow it to thaw overnight in the refrigerator. If baked from frozen, you may need to add an extra 10 minutes to the cook time. Can you freeze this chicken casserole once it’s been baked? Yes. Freeze it in air-tight containers for up to 4 month for best results. Thaw before reheating. Love this Cheesy Chicken Casserole with Cauliflower Rice recipe? Follow me on Pinterest, Instagram, and Facebook for more! 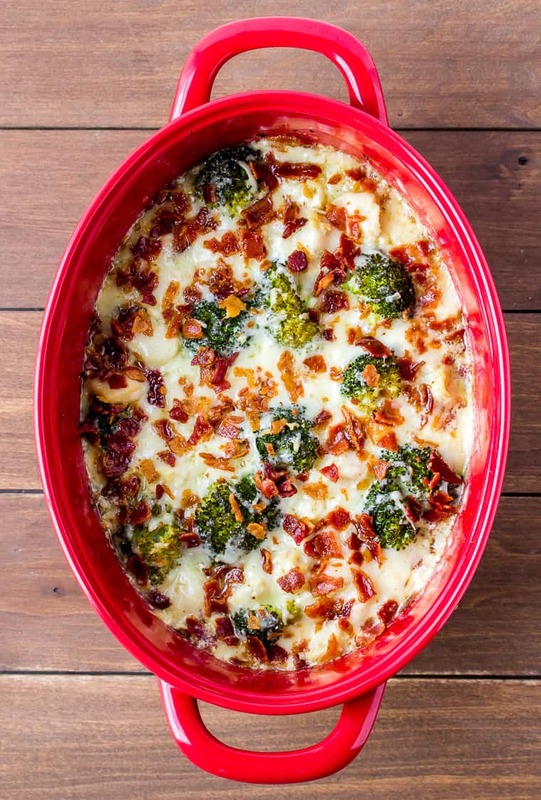 Keto Cheesy Chicken Casserole takes on all the same flavor of a traditional cheesy chicken and broccoli casserole but with a fraction of the carbs. It's an easy dinner recipe that the whole family will love! Season the chicken cubes with the adobo seasoning and add to the skillet with the garlic. Cook, stirring occasionally, until just cooked through, about 6-7 minutes. 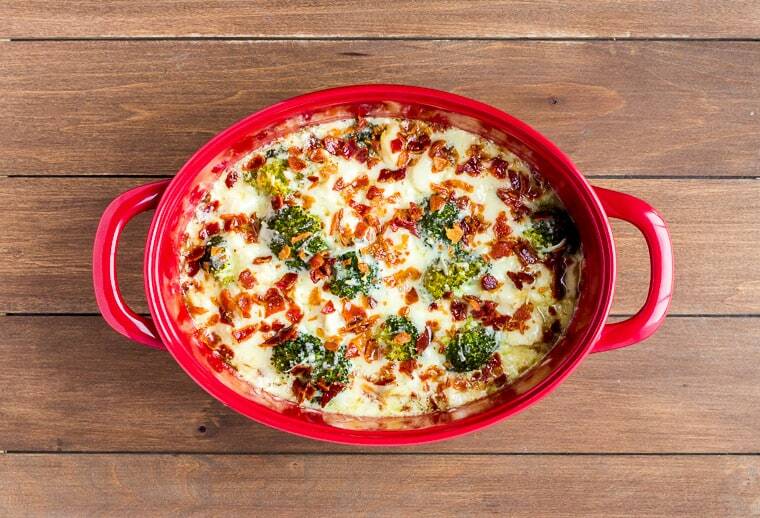 Add the riced cauliflower, broccoli florets, cooked chicken, bone broth, heavy whipping cream, 1/2 of the Gouda cheese and 1/2 of the bacon to a large casserole dish. Season with the salt and pepper and mix until well combined. Uncover the casserole and top with the remaining Gouda cheese. and bacon. Bake an additional 5-10 minutes until the cheese on top is melted and bubbly. Save time by purchasing already riced cauliflower from the produce section. Frozen riced cauliflower is not recommended and may lead to a more "watery" casserole. Can you make chicken casserole ahead of time? Yes. You can either make it ahead of time and keep it in the refrigerator if you plan to cook it within 1-2 days. Or you can assemble the casserole and freeze it, unbaked, for up to 4 months. You can bake it from frozen or allow it to thaw overnight in the refrigerator. If baked from frozen, you may need to add an extra 10 minutes to the cook time. Can you freeze this chicken casserole once it's been baked? Yes. Freeze it in air-tight containers for up to 4 month for best results. Thaw before reheating.